Before the 20th century, in its most basic sense naive art was any form of visual art created by a person who lacked the formal education and training a professional artist undergoes. Naive art could easily be dismissed as art that’s created by people who don’t know what they are doing, however that undermines the raw creativity found within artworks of this movement. Characterised by a childlike simplicity, Naive art often ignores the traditional three rules of perspective. These were defined by the Progressive Painters of the Renaissance, which said that to create a balanced work of art, artists must decrease the size of objects proportionally with distance, use muted colours with distance and decrease of the precision of details with distance. This fantastic piece Surprised! by Henri Rousseau, which hangs in the London National gallery is a great example of how Naive art ignores these rules. Producing works that not only appear appear geometrically flawed, with skewed perspectives and uneven shapes, but that also use bold colours regardless of the composition, and details appear that just as rich whether they’re in the foreground or background. This fantastic piece hangs in The National gallery, London. The result is work that is honest, accessible and allows viewers to gain an insight into the minds of artists who’ve taken an alternative path into the art world. Despite its humble beginnings, naive art is now a fully recognised art genre represented in galleries worldwide and we are delighted to share with you below our collection of Naive artworks at Trinity House. Lowry’s expression of Naive art is unusual in that despite having considerable art school training, his work is free from any desire to conform to academic rules. He creates a world of his own, childish and primitive, which is at the same time a potent way of seeing the cruel cityscapes of the industrial age. He finds a grim beauty in his views of red facades, black smoke and figures in white, snowy emptiness. He is a modern primitive, an industrial Rousseau, whose way of seeing is perhaps the only one that could do justice to the way places like Salford looked in the factory age. 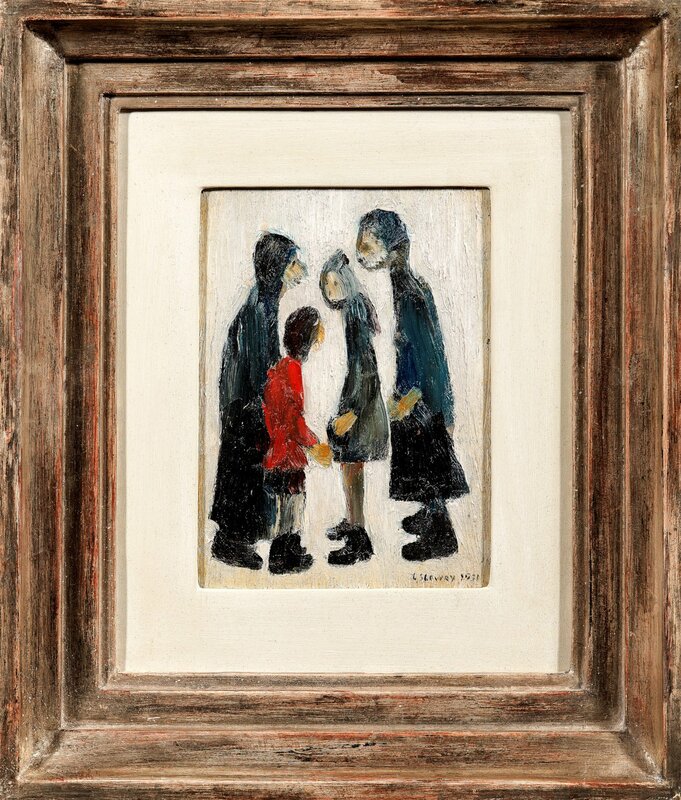 In Family Group, Lowry has depicted one of his favoured subjects, families going about their day. However he has done so with great abstraction, and a truly Naive style. The year of this piece, 1931, is important as the 1930s and 1940s are recognised as the greatest period in Lowry’s oeuvre, when his artistic vision was strongest. 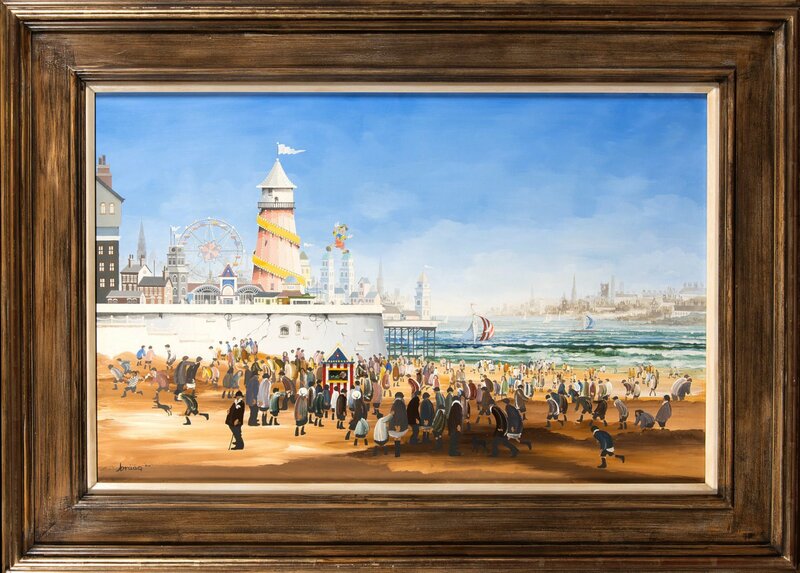 One artist that was particularly inspired by the work of LS Lowry was Brian Shields. His somewhat simplistic and highly stylised method employed to paint the characters in his scenes are certainly reminiscent of the caricatures created LS Lowry. Interestingly, the Liverpool Echo even went so far as to name Shields the “Liverpool Lowry”. Although showing artistic talent in his school years, Shields did not initially pursue a career as an artist. In fact, he left school and trained as a chef in Harrogate, where he spend the majority of his working life. Shields was only discovered when his murals in the hotel he was working in caused a stir in the community, and for weeks afterward there was a search in the local papers to find the identity of the artist. From this point on his artistic career flourished with his first exhibition in 1974. In 1977 Brian was invited to hold four exhibitions in London and was described by The Times as “one of the six most successful artists in England”. Artist Beryl Cook, best known for her original and instantly recognisable paintings of chubby jovial characters, surprisingly only took up painting seriously in her forties. Beryl attended Kendrick School in Berkshire, but left education at fourteen and started to work in a variety of jobs, therefore having no formal art training. In fact, during her early life and school days Beryl showed no interest in art at all. However there was one incident during a stay in Rhodesia that was to change Beryl’s life dramatically. It happened in 1960, when her son John was ten years old. She was trying to interest him in drawing and painting and had caught the artistic bug herself, so much so that her husband bought her a set of oil paints. Often comical, her works pictured people whom she encountered in everyday life, including people staying at the the pubs and guest houses that the Cook family owned over the years. Known for her distinctively stylised depictions of people and a mischievous use of light, colour, texture, and perspective that plays with the viewer’s sense of space and time, PJ Crook is a fascinating contemporary artist. PJ describes her work as figurative, narrative and mainly concerned with the human condition; often the relationship between two or three figures and the interior in which they exist; layered with time, although seemingly held at one moment. PJ’s paintings almost always continue over the frames, and this feature is an integral part of her works. PJ has often been called a Naive artist, and her style certainly portrays this. One thing you will also notice about PJ’s artwork, is that all of the subjects feature blank expressionless faces. However, it is this lack of emotional response, to the strange things happening to them, which help to create the all pervading dream like mood that is present in many of PJ’s paintings. New to Trinity House for 2019, Beth Rodway is the latest addition to our Contemporary cannon. Beth’s work is heavily influenced by the everyday. Working mainly with drawing; she plays with perspectives and space by abstracting the ordinary. ‘Boy in a Blue Bedroom’ is a fantastic example of the naive style, abandoning perspective and scale to focus on telling the story of the characters in the composition. Narratives hold a strong importance in Beth’s work and an obsession with detail has led to her drawings consisting of layers, many of which are not visible at first glance. Beth predominately works in pen and ink, although the last year spent at the Royal Drawing School saw her practice develop through colour and the medium of Gouache adding further depth to her storytelling.